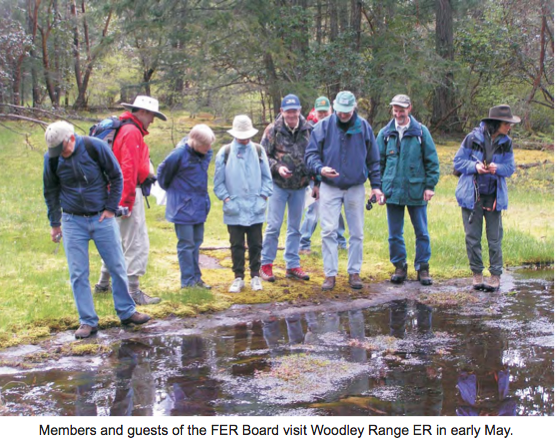 On Sunday, May 8th, seven Friends of Ecological Reserves Board members and two guests drove to the outskirts of Ladysmith on Vancouver Island to meet Gary Backlund and tour Woodley Range Ecological Reserve. Gary, along with his daughter Katherine are the ER Wardens and Gary was our intrepid guide for the day’s outing. The vegetative cover of the reserve is divided between forest, meadows and wetlands. Our hike took us to several of these beautiful meadows where we encountered sea blush (Plectritis congesta) and shootingstars (Dodecatheon pulchellum) in full bloom. We explored several large meadows. The meadows, with shallow soils over glacier polished smooth sandstone, support a rich spring flora before the seepage areas dry out later in the year. Spring gold (Lomatium utriculatum) and Alaska saxifrage (Saxifraga ferruginea) were out, but as this year’s spring has been quite cold, many of the flowers were not yet in bloom. In one wetland we saw the red listed bog bird’s-foot trefoil (Lotus pinnatus) which was not yet in bloom. 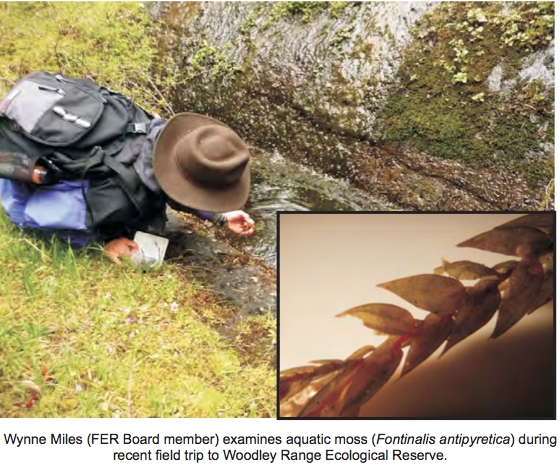 In the creek feeding this wetland we found the sometimes overlooked aquatic moss (Fontinalis antipyretica). The forests in the Woodley Range ER are mostly second growth Douglas fire and Arbutus forests. We also passed through a moister site with bigleaf maple (Acer macrophyllum) and red alder (Alnus rubra). 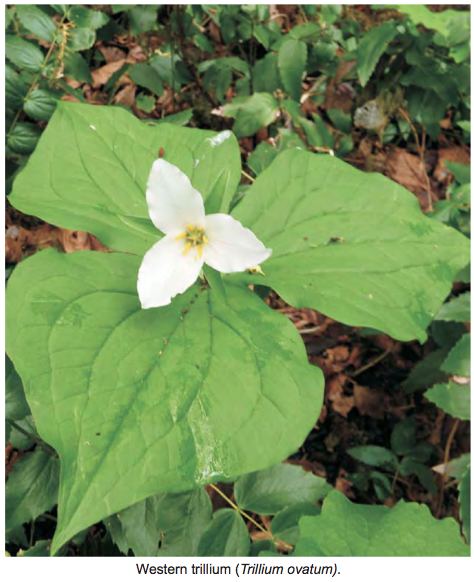 The understory in this area contained vanilla-leaf (Achlys triphylla) which was not yet in bloom, Calypso orchid (Calypso bulbosa) and western trillium (Trillium ovatum) which were both in full bloom. The Ecological Reserve protects a minimum of 187 vascular plant species, 27 of which are considered rare. 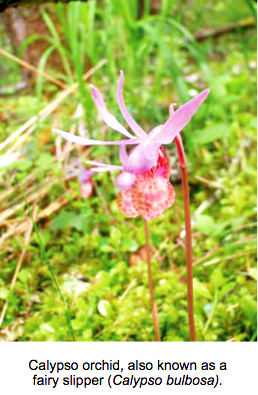 These rare plant species include: dune bentgrass (Agrostis pallens), slimleaf onion (Allium amplectins), white-top aster (Aster curtus), green-sheathed sedge (Carex feta), Nuttall’s quillwort (Isoetes nuttallii), Howell’s violet (Viola howellii) and bog bird’s-foot trefoil (Lotus pinnatus). 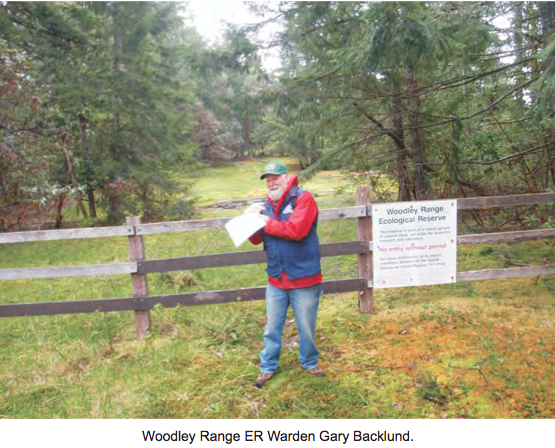 Gary informed us that some of the threats to this ER are illegal recreational activities such as motorbike and equestrian use, as well as invasive species such as Scotch broom. Broom eradication sessions have been held periodically and seem to be keeping the plant at bay. 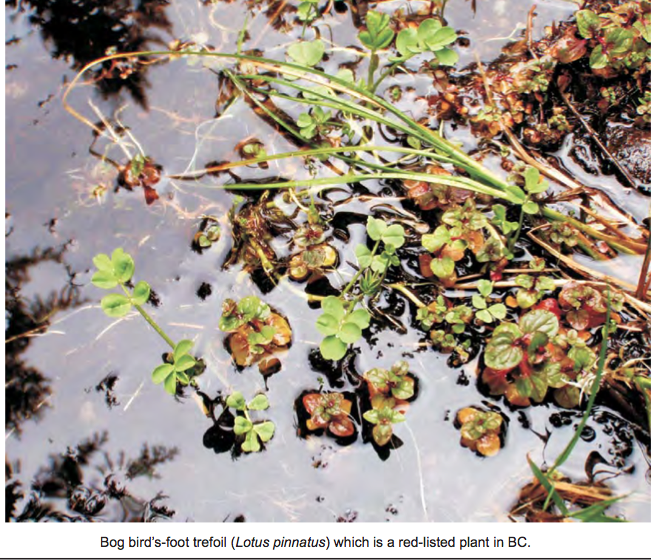 Sadly bull frogs (Rana catesbeiana), an invasive introduced species in BC, have now invaded the wetlands in the area. Gary also pointed out one location where gyprock had been dumped adjacent to the ecological reserve, and despite requests to have it removed it remains in place. This is a concern as when gyprock gets wet the gypsum dissolves into calcium and sulphate which could leech into the nearby wetlands. Range. This reserve protects an area of undulating lowland with numerous lakes, ponds and wetlands in the depressions.